Shiro is an easygoing teenager content with just being a student - until his seemingly perfect life is halted when a bloodthirsty clan, glowing red with fire, attempts to kill him in the streets. Unbeknownst to Shiro, he is suspected of murdering a member of their clan and will need a miracle to escape their vengeance. Miraculously, a young man named Kuroh Yatogami swings in and aids Shiro in his getaway, only to reveal he's also after Shiro's life. Now a hunted man, Shiro will have to evade the clans of seven powerful kings and desperately try to prove his innocence - before it's too late...! Airing in late 2012 and having the distinction of being streamed with English subtitles via the Viz website and Hulu on the day of release, K is a thirteen-episode original series by Studio GoHands, whose best-known work to date remains the Mardock Scramble movie trilogy. Like Mardock Scramble, K has much to commend it visually: lavish-looking backgrounds, attractive character design, and animation quality that, while mostly typical for a TV series, occasionally reaches some gorgeous heights. As with that movie series, the story tends to lag behind the visuals, but K isn't quite as flimsy as it first appears. The main character, Shiro, is the kind of breezy, affable young man who gets along with everybody and has girls fretting over whether he's eating right – a typical anime protagonist, in other words. Typically, he gets out of his depth almost immediately when a highly incriminating video of him shooting a stranger dead emerges and the dead man's cohorts, the super-powered street gang HOMRA, show up looking to avenge him. 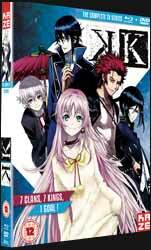 Opposing HOMRA are the equally superhuman police organization Scepter 4, while Shiro is aided in his flight only by the taciturn swordsman Kuroh – who has his own claim on Shiro's life to carry out, but refuses to let anyone else do the job for him – and his pet cat, who has a surprising habit of turning into a friendly, clothing-averse girl. With all this eminently typical anime baggage in hand, it's surprising how winning K turns out to be. On the face of it K seems expertly designed to tap into the kind of multi-media anime series that have become popular in Japan over the past decade: like hit series such as Durarara!! and A Certain Magical Index, it has an urban fantasy setting with a large, diverse cast of quirky super-powered characters who have their own soapy backstories, allegiances and enmities, together with a convoluted mythology and a grab-bag of elements partaking of various pop-cultural trends. Indeed, with its wilful lack of exposition and allusions to a larger story K often feels like a segment of an ongoing series adapted with the assumption that the audience already understands what's going on. While this might ordinarily count against it, the series' cheerful confidence and brevity, together with the broad characterisation, carry it through its thirteen episodes without becoming excessively talky or portentous. There are a number of flaws that mean K isn't as watertight a show as it could have been: the few female characters are largely distinguished by their fanservice-friendly designs rather than effect on the plot, despite the endearing Neko's surprisingly pivotal role. A flashback to WW2 Germany to delve into the origins of the super-powered Kings comes off as questionably tasteful, with the tragedy of the Dresden bombing turned into the backdrop for some winsome Nazi scientists' exploits. On the production side, the heavy blue filters layered over many scenes - also present in GoHands' other productions – detract from the well-executed backdrops and dull the impact of the otherwise attractive designs. K might be an expertly marketed and trope-friendly series, but it manages to elevate itself beyond its superficial charm and show signs of becoming a superior piece of commercial anime. With much of the show's backstory still unexplored at the series' close and a feature film set for release in summer 2014, it seems GoHands are set on mining its potential for some time to come; with luck K will wind up as one of modern anime's more enjoyable franchises.